I went to transfer my crabs from one small cage to a larger cage, the smaller cage was only about a 5 gallon cage, and I transferred them up to a 20 gallon cage today, and to my surprise, on of my "micro" hermies molted in the last couple of days. I thought that my hermie died, but here he just molted. I thought that he died, because he looked like the pet store one that I had saw that was dead. I went back about a half hour later, because I thought he was the one that I just bought and he was dead, I started checking my shells and here he was still alive. he must have ate most of his exo, because all that was left was his pincher shells. 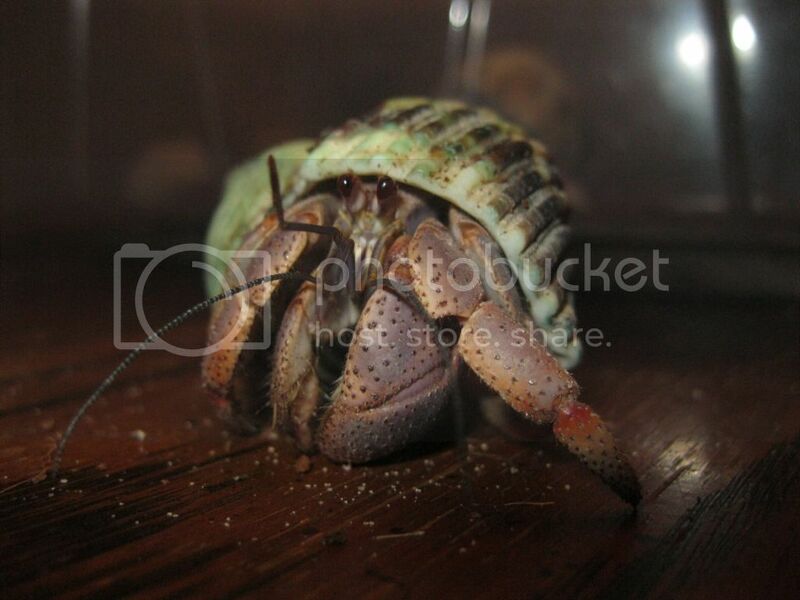 I do have a question though....how often do hermies change shells after they molt. I have some shells in the aquarium for them, but my fellow didn't change shells. should I be worried? he is in a natural shell, so I don't have to worry about a painted shell, but I am wondering how often will a crab molt before he changes shells? Well congratulations on your little guy's first molt with you. It is always exciting. I wouldn't worry about him/her not changing shells yet. Sometimes they just really like the shell they are in and other times they are just really picky about what shell they want to change into next time. I have had some that stay in shells that are too small or too big for them for the longest time even though there are plenty of shells for them to change into. I have also seen them try them on and then take them off and get back into their old shell again. In regards to how many times they molt in between changing shells that all depends on the crab. There is no set amount of molts before they switch shells, and often times they will pick a smaller shell right before they molt just to change into a larger one after. They can be fickle little buggers some times. Oh, and welcome to the site, and also the crabbing addiction. We are glad you found us. We would love to see pictures of your little guys and their home. Congrats on the molt and the tank upgrade! @ookami-Meggle got it exactly right. It all depends on the crab; their size, personality, how well the current shell fits, etc. Most of the time, they change shells after they moult, but unfortunately they crabs, so we really don't know what goes through there minds! Congrats on your crab's successful molt and welcome to the site!